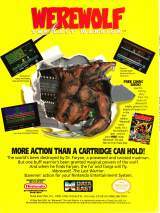 Werewolf - The Last Warrior © 1990 Data East Corp. He's BAD, RAD and extremely MAD - because to a WEREWOLF, there's nothing like revenge! The world's been destroyed by Dr. Faryan, a twisted madman possessed by an ancient spirit. Faryan's henchmen rule. 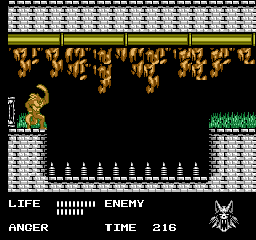 But one buff warrior's been granted magical powers of the wolf and is now out to bust-up Faryan. And when WEREWOLF finds him, the fur and fangs will fly! Released in November 1990 in the USA.